NBC NEWS PHOTO: Storms cause damage to a home near Chicago Tuesday morning. A powerful storm system is moving through the nation’s mid-section. A low pressure system is sweeping an intense cold front through the Midwest, with blizzard conditions in the extreme north, destructive winds in the Great Lakes region, and tornadoes from Texas to Kentucky. In Chicago, forecasters predict the storm could be the most powerful to hit Illinois in over 70 years. As of Tuesday morning, tornado reports have come in from several states. In Indiana, tornadoes were reported in Kokomo and Wanatah. 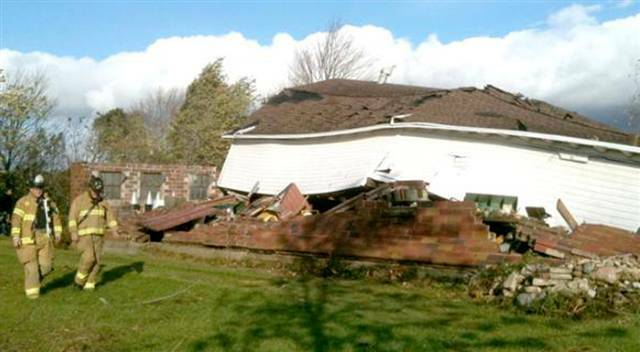 A roof was ripped off of a home in Peotone, Illinois. The people were injured there. Forecasters have not confirmed tornadoes yet, however they will be out soon to survey the area and determine what caused the damage. More than 62,000 customers were without power in Chicago. More than 40,000 reportedly lost power in Indiana. Hurricane-force winds are being reported this afternoon in northern Illinois and Indiana and through the Dakotas. The eastern Great Lakes are expecting waves to reach 25 feet with fears of beach erosion. NBC News is reporting 300 flights were canceled at Chicago’s O’Hare Airport. The National Weather Service said the storm is one of the strongest to hit the region in decades. “We’re expecting sustained winds on the order of 35 to 40 mph with gusts up to 60 mph throughout the afternoon,” Edward Fenelon, a weather service meteorologist in Romeoville, Ill, told NBC News. He said the storm’s central pressure is equivalent to a Category 3 hurricane. Weather Service Meteorologist Jim Allsopp tells NBC that the storm could be among the worst to hit Illinois in more than 70 years.